American Eskimo Dog Also known as Eskies, this breed is part of the Spitz family. Intelligence, agility and a willingness to please characterize their personality. They are effective as watch dogs though not aggressive. They need daily exercise and their large, double coat requires quite a bit of care. 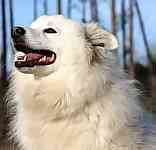 more information on American Eskimo Dogs. Bichon Frise This small dog just looks happy all the time because it usually is. Its coat resembles a white powder puff. These active and playful dogs do require daily exercise. This is a non shedding breed and needs combing or trimming every other day to prevent matting of their coat. 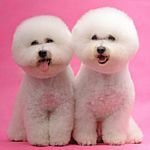 more information on the Bichon Frise. Boston Terrier This breed of distinguished looking dogs was developed in Boston, Massachusetts. 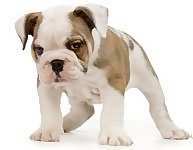 Although originally bred as fighting dogs, they have an even temperament are are excellent house dogs. Intelligent and lively in nature, they require moderate daily exercise and human companionship. more information on Boston Terriers. Bulldog One of the most recognizable breeds because of their unique face and sturdily built body. Their past breeding history was a bit grizzly but they have developed into a loving, amiable and pleasant breed. They do not tolerate hot weather and although they need daily exercise, this should not be a strenuous activity nor running or jogging alongside their owner. A great family companion that usually loves children. Chinese Shar-Pei Originally used as an all purpose farm dog in China, this breed retains some of those strengths and can herd, track, catch vermin and stand as guard dogs. Independent in nature, they are loving and devoted to their family members. Known for their classic wrinkled appearance they need daily exercise and training from a young age. more information on Chinese Shar-Peis. Chow Chow Often recognized for their black tongue and lion like mane, this is an ancient breed of dog originating in China. Independent and intelligent, they need early training and socialization, and moderate daily exercise. They do not tolerate warm weather and have the build of an Arctic-type dog. more information on Chow Chows. Dalmatian The American Kennel Club specifies two distinctions for this breed: they are the only spotted AKC breed and are the only coaching dog (that is, bred to run behind horse drawn coaches). Their high energy requires them to have daily vigorous exercise. An excellent family member that is loving and loves a warm bed. Finnish Spitz The national dog of Finland, Finkies are playful and lively, needing daily exercise. They have a lovely golden red coat and a fox like appearance. An excellent family companion as well as an excellent small game and bird dog. more information on the Finnish Spitz. French Bulldog Also known as Frenchies, they have distinctive bat ears. Although sturdy and muscular they are primarily a good natured lap dog. Hot weather does not suit them and a short romp every day will keep them happy. An excellent family companion. more information on French Bulldogs. Keeshond This outgoing and friendly breed is excellent with children and other pets. Very good as a watchdog, they are non-aggressive in temperament. Kees, as they are also known, need daily exercise and moderate coat care. Lhasa Apso An ancient breed of Tibet, these dogs were prized indoor watchdogs of nobility and Buddhist monasteries. Very independent and stubborn, as well as playful and energetic, they are excellent family companions, although not your typical lapdog. They require moderate daily exercise and grooming of their long haired coats. 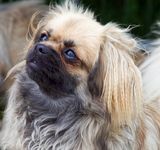 more information on Lhasa Apsos. Poodle An exceptionally smart dog, they were originally bred as water retrievers. There are three sizes and the standard is the oldest of these. Excellent with children and very playful, these popular dogs equally need mental exercise, physical exercise and human companionship. One of the true hypoallergenic breeds. Schipperke This is a tailless breed that has its origins in the Flemish regions of Belgium. Bred as a watchdog and vermin hunter, his all black coat is unique and somewhat coarse to the touch. A good family dog that is active and energetic that benefits from early training. Shiba Inu This breed is native to Japan and was bred to hunt game by both sight and scent. Although very independent in spirit, with early training and sufficient daily exercise they are good family companions and watchdogs. Tibetan Spaniel Affectionately known as Tibbies, this is one of three ancient breeds native to Tibet. This is a happy and independent dog. An excellent companion, happiest with people, they need a daily romp and weekly brushing of their coats. Tibetan Terrier Known as the Holy Dogs of Tibet, this ancient breed is agile and able to withstand very cold weather. They are intelligent and sensitive and make loving family companions. Daily exercise and a nice coat brushing twice a week keeps them healthy; patience and affection keeps them happy. The Non-Sporting Group is perhaps the most diverse of all of the American Kennel Club classifications of dog breed groups. The group exists because the AKC decided these breeds did not fit nicely into any of the other breed groups. This group is also referred to as the Utility Group. The breeds in this group vary greatly in size, appearance and personality. All breeds are considered not only sturdy animals, but wonderful purebred dogs. There are many well known dog breeds that belong to this group, including the Standard Poodle, the Dalmatian, and the Bulldog. Some of the lesser known breeds are the Schipperke, the Shiba Inu, and the Tibetan Terrier. This breed directory page features dog breeds that are members of the AKC Non-Sporting Group.